The following points should be kept in mind when deciding on a site for biogas plant construction. For proper function of the plant, the optimal temperature has to be maintained in the digester. Therefore, a sunny site should be selected to keep the digester near 35 degrees Celsius (95 degrees Fahrenheit). This is more important in the higher elevations year-round while generally a concern in the winter only for the lower elevation sites. To make plant operation easier and to avoid wastage of raw feedstock the plant must beas close as possible to the feedstock supply (toilet, animal pen, compost pits, etc.) and water source. 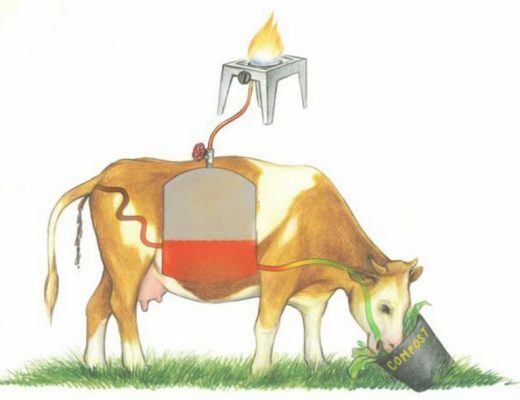 If a readily available supply of feedstock or water or both is not available then the biogas plant should not be installed. Gas pipe length should be kept as short as possible. A longer pipe increases the risk of gas leaks because of the increased number of joints; the cost of a longer pipe is also a factor. The main gas valve should be opened and closed before and after each use, therefore the plant should be as close as possible to the point of use to facilitate proper operation. The edge of the foundation of the plant should be at least two meters away from any other structures to avoid risk of damage during construction. The plant should be at least 10 meters away from groundwater wells or surface water bodies to protect water from pollution. be marked by rotating the end of the cord in circular fashion. A suitable arrangement must then be marked for the inlet tank, inlet-pipe(s), outlet-chamber, compost-pits and gas piping. After the site layout is marked, the engineer should review the selected location again to ensure the best site has been chosen and will not interfere with other activities normally performed at the planned biogas plant. The pit depth is indicated on Figure 2.1 under dimension ‘E’. The excavation work should only be started after deciding the location of manhole and outlet tank. For safety, the pit wal1s should be vertical and stepped from the ground surface by one meter away from the center of the excavation for each meter in depth excavated. Photo 6.1: Excavation for Digester. Mechanical or Manual Excavation is Practical. Excavated soil should be placed at least one meter away from the edge of the dig so it does not fall inside the pit during construction. The pit bottom must be leveled and the earth must be untouched. If the design depth cannot be achieved because of hard rock or high groundwater, the design will need to be modified to a smaller plant or wider digester or combination of both. It is not recommended to construct the biogas plant at or below the groundwater table elevation. The earth base of the excavation is then compacted using mechanical or manual tools. ASSALMOALAIKUM. sir if the your sit in our language it is most useful for all of us.please try your best for it.ALLAH BLESS YOU.